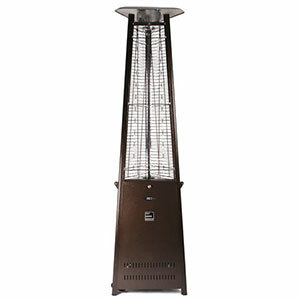 The Outdoor Order Prism™, is the zenith in tower heater design. Standing eight feet tall, this elegant triangular heater provides outstanding warming characteristics and superior ambient lighting. The ceramic burner emits 44,000 BTUs of radiant heat from a vertical flame stretching four feet up its sparkling borosilicate glass tube. With advanced push button ignition, starting the Prism™ is a snap. Or use the included wireless remote, with on/off control and a choice of five heat settings. Uniquely, no matter the setting, Prism’s™ outer surfaces remain safely warm. Its small footprint enables you to place it virtually anywhere. Beyond its balmy comfort, the Prism’s™ visible flame enhances your outdoor environment with lush ambient light. The selection of quality finishes, like original Stainless Steel or the new Carbon Matte Black, means you’ll have a heater to match your personal style. It looks great, heats great, and lights your space as well. What could be better than that?